HMS Belfast Radio Room. The Royal Naval Amateur Radio Society (RNARS) operates a low power radio station on board this ship and other preserved Royal Navy museum ships as well. As Tenth Cruiser Squadron flagship on the Murmansk convoy run, Belfast could transmit and receive multiple signals on different frequencies at once. 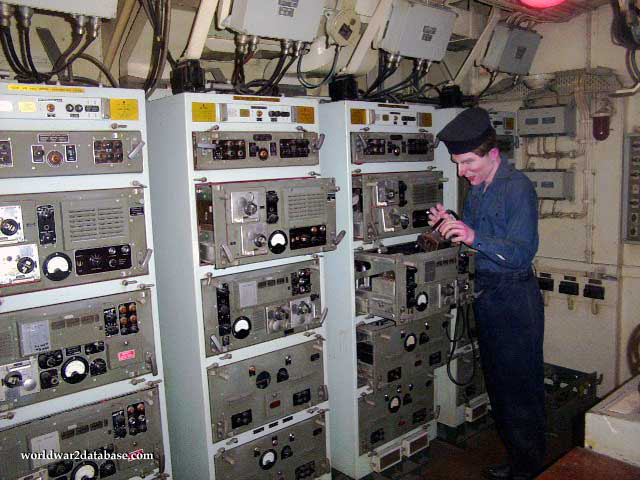 Older US Navy ships would have a separate sending and receiving room, but I'm not sure how the Royal Navy set up their communications. This entire room would fit into a single computer chip on board a modern ship.